Laura Jean Arvin born Oct. 23, 1947, in La Porte, Indiana, to Warren and Martha Bunton. 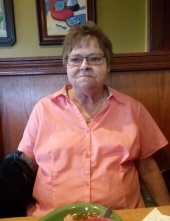 Passed away April 8th 2019 at home in Knox with her loving family. She married Kenneth E. Arvin on June 20th 1981 he preceded her in death. She has three children Penny Singleton, John Korp Jr. and Danny Korp (deceased) she has four grandchildren Eric Baughman, James Berger, Derrik Singleton, and Hannah Viedan and five great grandchildren Zyler Baughman, Allysson Baughman, Rori Baughman, Ryleigh Berger, and Seth Singleton. She has five sisters Sherry Lindsley(Kenny), Ellen Scott(Earl), Margaret Carroll(Greg) Donna Cannon, and Rose Cook. And six brothers David Pointon, Mike Bunton(Marlene) Doug Bunton(Glenna) Warren Bunton(Carolyn) Ron Bunton(Cara) and Don Bunton(Tina). She is preceded in death by her son Danny Korp and her parents Warren and Martha Bunton. She owned and ran the LJ Round-up for many years and prior to that she enjoyed selling home interior she has been battling illness for many years. Laura's family is having a visitation on Wednesday April 10, from 10am(cst) to 1pm(cst) with a funeral at 1pm(cst). An interment will be held at Eagle Creek Cemetery after the funeral. To send flowers or a remembrance gift to the family of Laura Jean Arvin, please visit our Tribute Store. "Email Address" would like to share the life celebration of Laura Jean Arvin. Click on the "link" to go to share a favorite memory or leave a condolence message for the family.